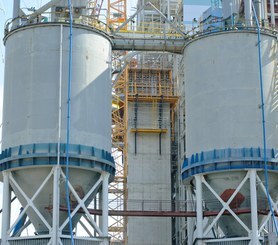 It has taken almost a year to build the Biomass block of the Połaniec plant, leading example of Poland's energy industry. 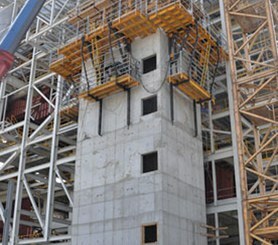 The vertical communication of the building was solved with the construction of two 70 m high lift shafts. Apart from a biomass tank, simple and trapezoidal walls, as well as roofs for the warehouses were built. 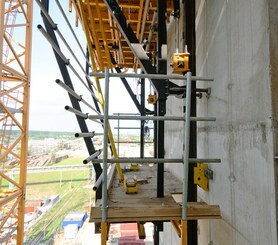 ULMA used for the first time the ATR self-climbing system in Poland, which solved the problems of limited site space and complex crane operations for the formwork movement. Each lift shaft has three sides, needing 6 hydraulic cylinders. The formwork was moved 19 times by lift shaft. The ATR System works without crane and under adverse weather conditions. Moreover, its large platforms and handrails ensure workers' safety. The inside of the lift shaft was done with KSP Platforms.